Brothers Cameron and Christopher Ervin are charged after an attempt to kill their parents. GWINNETT COUNTY, Ga. -- Two Gwinnett County brothers accused of trying to blow up their house with their parents inside will not go to trial. The brothers agreed to a deal offered by the district attorney and pleaded guilty on Monday to numerous charges. Christopher and Cameron Ervin are accused of acting on a plot to kill their parents on Sept. 5, 2015. They pleaded guilty to kidnapping, aggravated assault, armed robbery, false imprisonment and other charges on Monday. The judge sentenced the brothers to 50 years in prison, with 20 to serve and the remaining 30 on probation. The brothers could get out on parole after 10 years. Police said it appeared the two drugged their parents, then tried to burn their house down. They failed, but then “went back in to finish the job," Gwinnett County District Attorney Danny Porter previously said. In a court hearing on Monday, detectives outlined more details about the attack. The detective testified that the brothers didn't expect the attack to get so violent. Detectives testified that Christopher Ervin tried to smother his father and mother. The brothers are accused of then stabbing their father and then wrapping their mother's face in Saran wrap. When that failed, the detective testified that Christopher said "this isn't working; we'll have to shoot them." Police said the brothers planned to go to their grandparents in Tennessee. After the attack, the brothers allegedly told police that their relationship with their parents was strained, and that the brothers made references to being "high" during the attack. During a disturbing 911 phone call, their mother Yvonne Ervin told responders her children had drugged her and her husband, attacked them and were trying to kill them. Yvonne and Zack Ervin held hands as the 911 recording was played during Monday's hearing. In the plea deal proposed on Monday, Porter recommended 30 years in prison plus 20 years probation for the brothers. Without the plea deal, the brothers could have received life plus 160 years. Zack Ervin testified that he visits his sons regularly in jail, and said he didn't know Christopher had a drug problem. In talking about the attack, Zack Ervin said, "That night, I saw Satan. I knew shortly after that, that what had happened to us wasn't my sons." The father asked for reduced sentences for his sons, saying they were both remorseful. He said he didn't see himself as a victim. "I'm a father first," he said. "I have to forgive them." Yvonne Ervin was next to take the stand. She said that Christopher had been kicked out of the military after failing a drug test. She said that she believed her son Christopher had "smoked some bad marijuana" on the night of the attack. The mother said that she and her husband visit their sons once a week and talk several times a week on the phone. She also asked for a lesser sentences than the one proposed by the district attorney, suggesting probation. A tearful Yvonne Ervin noted it was Cameron's 19th birthday, and asked if she could give him a hug. Christopher Ervin later told the judge that he has substance abuse problems, saying the difference between when he's sober and under the influence is "night and day." He apologized and said he was "at lowest level part of my life." He explained that he got into drugs and alcohol after high school. He said he became addicted and lost all control. Since his arrest, Christopher Ervin said he's completed an AA program and has been sober for 14 months. He apologized to his parents and his brother for not confiding in them and not trusting them to help. He then apologized to his brother for introducing him to drugs, and not being the brother he should have been. Cameron Ervin took the stand and expressed extreme remorse. He said he was sorry for breaking up his family. He said since his arrest, he realizes how much he loves his parents and how much they love him. He said he held a grudge against them for the way they brought him up and that he turned to alcohol and drugs. He noted that it was his birthday and said being able to see his parents and how much they love him is a gift. He said that he and his brother were not the same people they once were, and said he's grateful that God spared them. 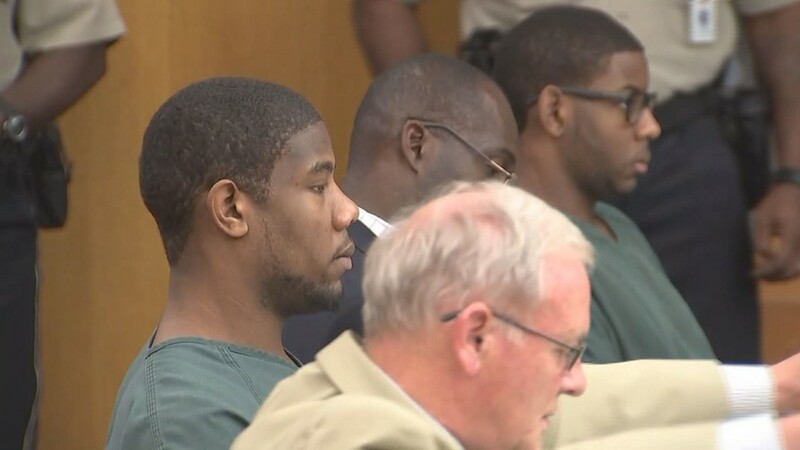 The brothers' attorneys asked for a sentence of 10 years. Court documents previously indicated Cameron's attorney filed numerous motions in the case requesting a psychological evaluation for his client. In court Monday, the district attorney's office said that Cameron Ervin had been diagnosed with "narcissistic personality disorder." Christopher's attorney previously told 11Alive they have been kept apart and have had little contact with each other. Two weeks later though, in an interview with 11Alive, Cameron and Christopher’s parents asked the judge that their sons be forgiven. Then in January, their mother wrote the judge again saying her sons did not belong in jail. But they have remained in jail.